LIES AND DESERTION CHASE BETH FROM HER HOME TOWN. A heartwarming Christian short story – Five years ago Cora Grace allowed a traveling couple into her home when the wife went into labor. After her death, Cora helped the widower Alex Miller raise the baby. Now three visitors from the East arrive–with business with Alex. Their presence shakes the comfortable world Cora and Alex have made for themselves–will it draw them even closer together, or push them apart? This is a wonderful, sweet romance. I enjoyed reading about Catrina and Gilbert’s struggles as they overcome seemingly insurmountable obstacles in order to be together. 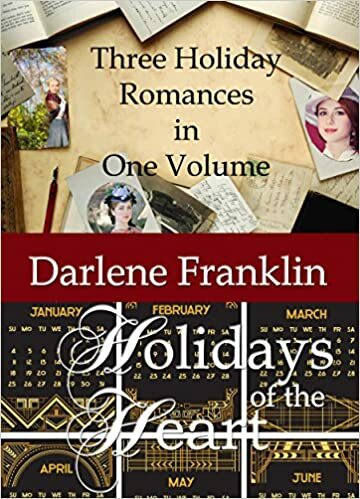 Ms. Franklin has a writing style that pulls you into the story and begs you to return. I’m not usually drawn to stories set in the early 1900’s. Something about the time period doesn’t entice me to read, probably because most of them deal with the atrocities of war, and the ensuing heartache. While Love’s Glory does mention the recent war, Garan and Beth’s story is more about what happened before the war and then the consequences. The story deals with sin and accepting God’s forgiveness once you’ve confessed. In the end, truth really does set you free. There were moments in the story that I wondered how it would turn out, but all in all I enjoyed this sweet romance. As Cora put it, sometimes you have to walk through the valley of the shadow of death to get to the other side, and that’s what this book is about…walking through the pain to find joy. Cora and Alex’s story pulled me in, and I loved the way it ended. I enjoyed these three novellas, though as a self-proclaimed(well, others say it about me too) grammar snob, there were quite a number of mistakes–mostly missing words. The stories were well-written, and the missing words were only slightly distracting.